SONOMA, Calif. – Losers of two in a row, the Sonoma Stompers came out strong against the San Rafael Pacifics Friday night, scoring in the first inning and holding the lead all game long to get back on the right track and win 7-5. Miles Williams’ offensive tear from the second spot in the batting order proved to be no fluke and he connected for his sixth home run of the week in that position, his 12th of the season in the first inning to put Sonoma up 2-0 with no outs. Two-out singles from Kenny Meimerstorf and Marcus Bradley added runs in the second and third. Williams drove in two more on a two-out single in the fifth, adding insurance for the Stompers and giving them seven runs in the game. Seven runs was enough for the pitching staff, who limited San Rafael to five runs over the night. Ethan Gibbons delivered yet another quality outing, his fifth in eight starts of seven innings, he struck out six and walked just one Pacific batter. Cole Watts and Jacob Cox finished off the game, with Cox earning his league-leading 11th save of the year. 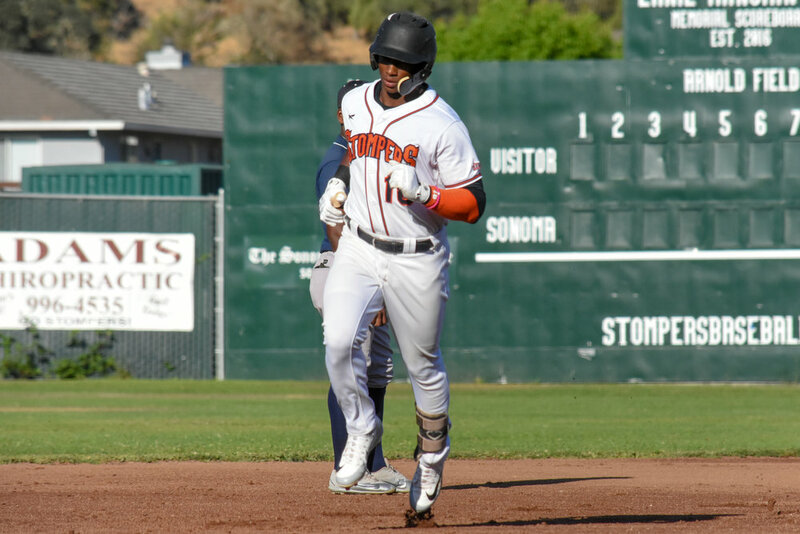 The Stompers travel to Martinez for a two-game series against the Martinez Clippers before returning to Sonoma for a four-game homestand next week.